This is TinyTetris. Russian Music included. From a hardware perspective, all you need is the basic TinyScreen Video Game Kit and, if you want audio, an additional Proto Board TinyShield (or Proto Terminals, or anything that allows you to connect a speaker to the 'duino pins) and the speaker: for this I broke an old mobile phone headphone that had been lying in the dust for years. 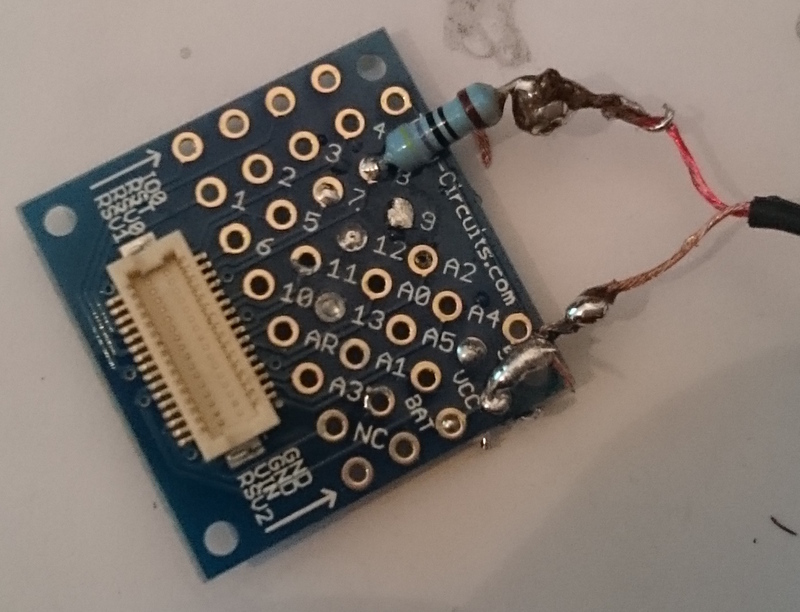 To add audio, solder like in the pictures (I am very bad at soldering so I'm pretty sure yours will be better). Pin 8 to 470ohm resistance to speaker to GND. Without the resistance it still works (connecting the speaker directly), but I think it is too loud. If you have a potentiometer, that would be the best. Another option is to add other resistances like shown here https://raw.githubusercontent.com/LenShustek/arduino-playtune/master/mega_photo.JPG . If you add another resistance to pin 7 (maybe with more ohms) you would be able to play more complex songs with a second track (maybe at a lower volume). I didn't have one at hand, so for now this is it. If you try, let me know. From a software perspective, all is included below, just upload and run. Anyway this is all already included in the sources below, so, unless you want to change the music, you don't have to do anything. Change #define USE_JOY 1 to #define USE_JOY 0 in source (main file). Implement high scores handling, maybe saving to EPROM (kept at shutdown). Implement game "noises" other than the background music (pieces dropped, lines cleared, etc..). Add a way to pause the game! Implement better background music (with two or more tracks) soldering more resistances and importing a more complex midi file. Better abstraction of inputs and outputs to allow easier porting and change of configurations: for example to flip the screen upside down (i.e. to put in smartwatch kit) you also need to flip the buttons, and this now means editing the main game loop. Implement a game menu to change options like size, game kind, inputs, show/reset high scores etc..
That's it, if you have installed the CodeBender plugin, and connected your board, you will see a green Run On Arduino button below. Choose the right serial port and platform and click on the button. Have fun.